Betsey Johnson loves her girly bags, and has been accused of going a little bit over-the-top in the past. This satchel definitely pushes the boundaries; do you love it or hate it? The basic premise of this crocodile print purse is actually quite delicate. The blue lines against the glossy black PVC are a stylish elegant combination, and if the purse had been left as that then it would have looked just fine. It is the blue lightening strike tag that pushes it slightly too far, but you should be able to remove that! Whatever you think about this purse, the pockets are undeniably great. Aside from adding eighties vibes and a bit of a bowler attitude, they provide you with plenty of outside storage space in addition to the lofty interior. All in all this is a spacious satchel with potential to look great, especially with dark black outfits where it is the focal point. Be careful not to over-clutter it, and you will have a girly Betsey Johnson purse to be proud of. 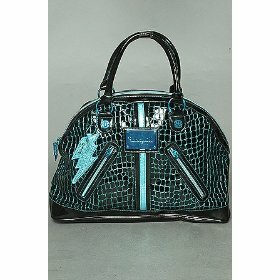 The Betsey Johnson Frills satchel, a great alternative to this patent bag. o.m.g i lovwe it i want it so bad where did you get it? It looks like eBay has all sold out, but click on the “Search online for this bag link” near the bottom of the article. It shows a few websites still selling it.